Discovery Girl magazine is the best life and advice periodical for your daughter. In each issue she will be able to read features that will help her to learn from her mistakes, deal with disappointments, navigate friendship difficulties, and many other character- and confidence-building articles. You will enjoy seeing your child enjoy and learn from this publication. In each issue of Discovery Girl magazine, your daughter will find many articles packed with wise advice. There are suggestions for what to do in a wide variety of situations. You can be sure that all of the features are age-appropriate and safe for your child. She will enjoy receiving advice while feeling independent solving her own problems at school, with friends, in embarrassing situations, or even with her own emotions. It can be hard to be a preteen or young teen girl, but this magazine helps to make it a little easier! In addition to many high-quality advice articles, there are also many fun features and projects that your child will enjoy reading and doing. She will find each publication packed with fun features such as tutorials for making BFF necklaces, funny real-life stories from girls like her as well as celebrities, fun quizzes, and great contests that she can enter. 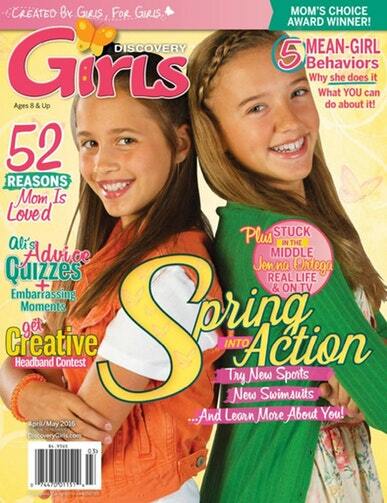 You will love seeing your daughter begin blossoming into a young woman with the help of Discovery Girl magazine! Discovery Girl magazine provides your child with many great opportunities to be involved with and contribute to each issue. She can submit questions to be answered in the recurring advice feature, share “My Worst Day” stories to help encourage others that bad days are normal and okay, and even participate in healthy and educational debates. You will love seeing your daughter’s self-esteem and confidence rise as she enjoys reading these magazines! Order your daughter a subscription to sound advice and tons of fun by getting a discount Discovery Girls magazine subscription for her today!